Pst Viewer will open and search Outlook pst file email messages. Search for important emails, reply, forward, and even convert emails to PDF files. Extract file attachments from email and save them to your hard drive. 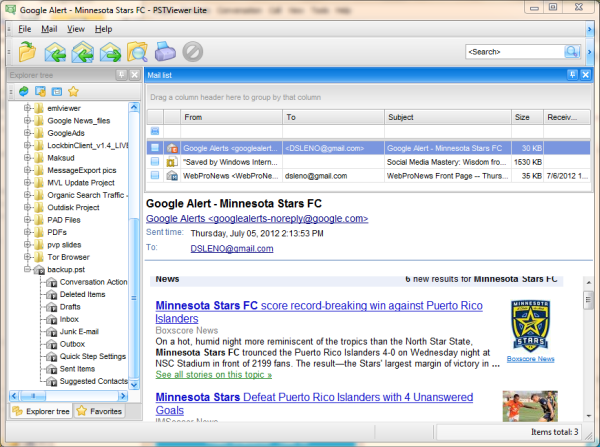 Pst Viewer Lite is a highly accurate PST email viewer, and is actually 6 viewers in one. In addition to PST files, it can also read Outlook MSG and OST files, EML, MHT and winmail.dat files. Pst Viewer Lite can be installed as an MSI file for enterprise deployment. It uses the same advanced email parsing engine as it's big brother, Pst Viewer Pro. Pst Viewer Lite can also convert individual PST email messages into PDF, MHT, HTML, BMP, GIF, TIF, BMP, PNG and TXT. Download Pst Viewer free and see why so many business people trust Pst Viewer Lite to render and search their PST file email content. Statement: First, please download the orginal installation package by clicking the download link. Of course you may also download it from the publisher's website. Using Pst Viewer Lite crack, key, patch, serial number, registration code, keygen is illegal. The download file hosted at publisher website. We do not provide any download link points to Rapidshare, Hotfile, Depositfiles, Mediafire, Filefactory, etc. or obtained from file sharing programs such as Limewire, Kazaa, Imesh, Ares, BearShare, BitTorrent, WinMX etc. Software piracy is theft. If you like Pst Viewer Lite please buy it.